Tomorrow is the first day of October, and as such, it’s about time to start getting in the mood for Halloween. Of course, I realize that most retailers have had their Halloween stuff out since June, but for those of us who like to keep the holiday seasons relatively intact, it makes more sense to at least wait until a holiday is less than a month away to start celebrating. Our video tonight is one created a few years ago by yours truly and his wife. Recorded May 30, 2015 at WonderFest USA in Louisville, Kentucky. The above video was shot by Melanie Larch and edited by your PopCulteer. 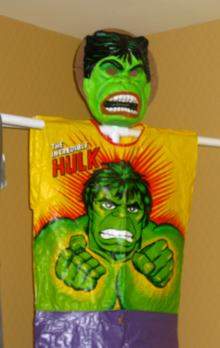 The PopCult and Radio Free Charleston crew stumbled onto this incredible collection of delightfully cheesy, vintage Ben Cooper Halloween Costumes, tucked away in a little room just off from the main hallway at WonderFest USA, the annual fantasy and SF modelers convention. Presented by a die-hard collector named Jeff, this was a fun and surprising little diversion to find just as we were on the way out the door to come home. We didn’t get much information about Jeff’s collection, but it sure looks cool and has lots of very rare items. 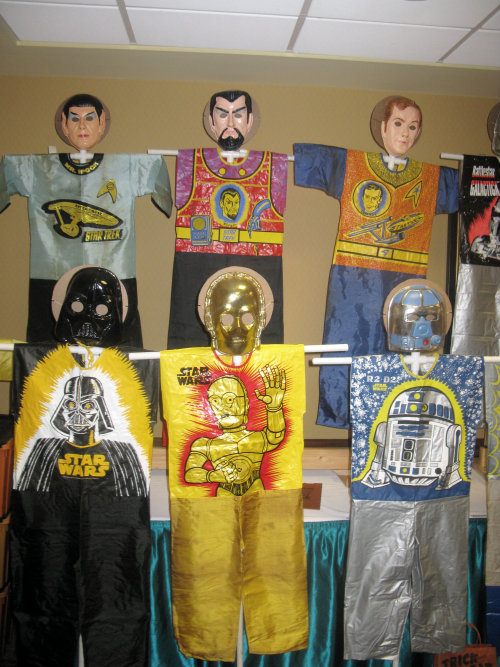 This incredible collection of delightfully cheesy, vintage Ben Cooper Halloween Costumes, was tucked away in a little room just off from the main hallway at WonderFest USA, the fantasy and SF modelers convention. We were actually alerted to this treasure by our friends from JoeLanta, who were also at WonderFest, taking in all the coolness. As for Ben Cooper Inc., the costume-maker struggled through a few bankruptcies and other setbacks before shutting down over twenty-five years ago. Last year the descendants of the original owners seemed to be staging a comeback, licensing their designs to folks like Retro-A-Go Go (who have just relased a new series of their oversized Ben Cooper mask wall hangings), but they haven’t posted anything to their Facebook page since last December, and their website is currently down. Let’s hope this is just a blip in their comeback. But we do have this video valentine to Halloween to get you in the holiday spirit. This week we go back to April Fool’s Day, 2012, for a show that has taken on a bit of a bittersweet aura. 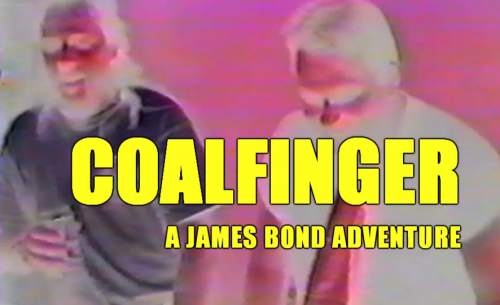 This episode presents Coalfinger, a film by Johnny Rock, whom we lost a little over a year ago. It was April Fool’s Day, and it was time to show the world this short film that Johnny and Tim Rock came up with, with a little help from Stephen Beckner, Jason Ashworth, yours truly and other members of the Go Van Gogh inner circle. The premise was that a Southern West Virginia theatre troupe somehow wound up with the rights to make a James Bond movie, and potshots were taken at lots of local creative types. Making this film remains one of the most fun times in my life. As with most of our April Fool’s Day specials, the original production notes were written in jest. You can read them HERE. 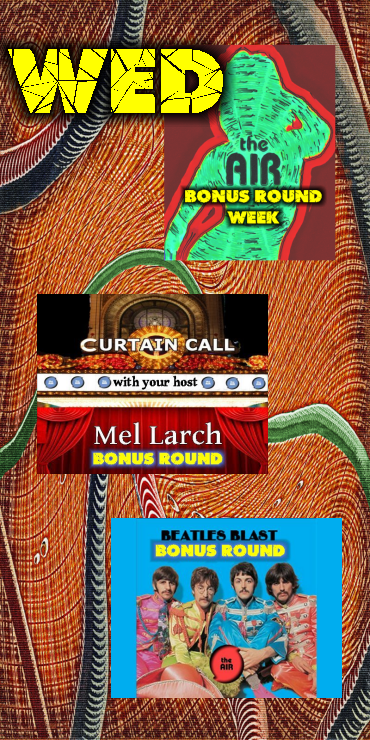 Welcome to PopCult’s guide to Bonus Round Week on The AIR. This week, Tuesday through Saturday, each programming day on The AIR will be split between two mini-marathons of some of our most popular specialty music programs. Saturday sees Radio Free Charleston International, our tribute to free-format radio, take the daytime spot, from 7 AM to 7 PM. On RFC International, yours truly basically gets to play anything he wants. This was why I got into radio in the first place, to play cool music that you may or may not have heard before. I may mix New Wave Music with Swing, with Progressive Rock with The Beatles or Stones or really anything I feel like playing. My musical tastes are all over the map, and so is this show. You really sort of have to listen to find out what it’ll be each week. 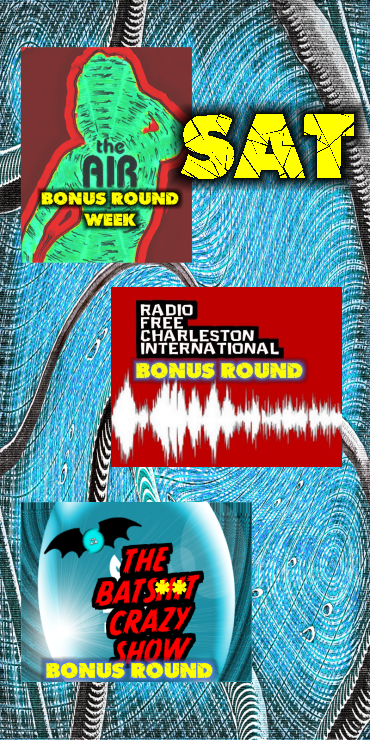 Radio Free Charleston International can be heard Friday at 1 PM, Saturday at 1 PM and 1 AM, Sunday at 3 PM and Tuesday at 10 PM. It gets around a lot. From 7 PM to Midnight, you can hear ten episodes of The Bats**t Crazy Show. Imagine Dr. Demento on LSD with Tourette’s Syndrome, and you have an idea of the chaos that awaits you. The Bats**t Crazy Show can be heard Tuesday through Friday at 6:30 PM, and for ninety minutes every Saturday at 7 PM. “Big Pink” was the house where The Band recorded the album after coming off of a tour as The Hawks, backing Bob Dylan. The house was shared by band members Rick Danko, Richard Manuel and Garth Hudson in West Saugerties, New York. Bob Dylan’s legendary Basement Tapes were recorded at Big Pink before The Band decided to strike out on their own, but remained unreleased (officially) until 1976. The house itself has become a sort of venerated location, and Charleston filmmaker Lisa Tignor decided to create a film about people making a pilgrimage to this legendary domicile. Her journey in making the film is quite the story in its own right. Lisa sent me a detailed press release about her film, and the details for this piece were sourced from that. This is something that more people need to know about. The film is simultaneously a road trip, a tribute to a great band, one fan’s interpretation of a song, an example of subversive filmmaking, and a couple’s vacation video. The film targets a niche audience: fans of The Band and people who love road trips. The film is currently making its festival run with five official selections and one award so far. “This is just the beginning,” says Director, Lisa Tignor (left). This is a film that almost didn’t make it to the public. “It was shot in 2015, and I thought the editing was complete in 2016, but it was clear that something was missing.” Tignor decided to shoot the equivalent of a music video and splice it between sections of the documentary. This created a new obstacle. After hiring lawyers, she found she could not get the rights to the song “The Weight.” Tignor stewed over this, thinking she would have to dump the entire project. Then she had an idea. “While the travel portions are a bit shakey, the cinematography on the music video sections couldn’t be more beautiful! I couldn’t let this film not be seen!” She added time cues to the film, and explained in the narrative about the struggle to get the music rights. 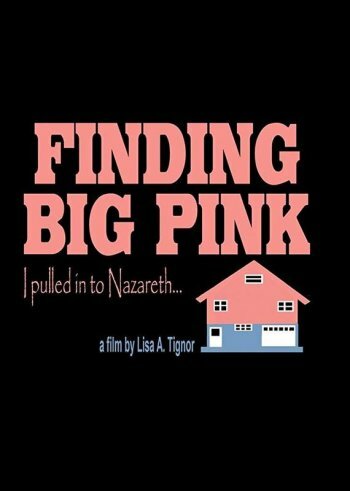 The Band fans watching Finding Big Pink at home could cue up “The Weight” to its appropriate point and see the film as it was intended. No laws are broken, no rights infringed and no copyright lawyers were harmed during the making of this movie. Anyone watching it at a festival will be treated to royalty free music. 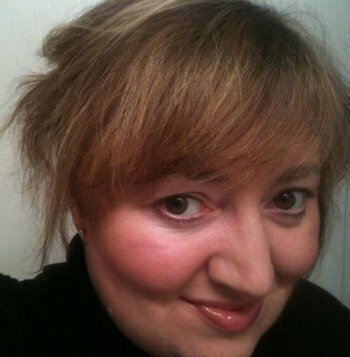 Indeed, ten years ago, animator Nina Paley, faced with ridiculous rights fees for music in her feature film, Sita Sings The Blues, chose to release her film under a Creative Commons Attribution-Share Alike License, which meant that she could show it and distribute it, as long as she didn’t make any money directly from selling the music. You can see that film right here in PopCult at this link. Finding Big Pink stars relative unknowns from West Virginia, but David Tackett might be recognized from his live theatre work. Zach Labin, of Appalachian Video Productions, wieded the camera for the beautiful cinematography. As soon as Finding Big Pink wraps up its festival commitments we’ll tell you where you might be able to see or buy a copy. In the meantime, it sure would be cool if this project could get a local showing. That’s this week’s PopCulteer. By the time you read this I should be back in Charleston after hitting Chicago for part two of my anniversary trip with Mel Larch. I’ll tell you all about that next week. Friday sees Sydney’s Big Electric Cat, our showcase for the best music of the New Wave era, take the daytime spot, from 7 AM to 7 PM. Sydney’s Big Electric Cat is a two-hour blast of spectacular New Wave music presented by legendary DJ Sydney Fileen and produced at the Haversham Recording Institute in London, England.Each week Sydney treats us to 120 minutes of rock music from one of its most creative and inspired eras, when punk and prog and electronica collided with rockabilly and fashion and video to make some of the most exciting music in history. Sydney’s Big Electric Cat is produced at Haversham Recording Institute in London, and can be heard every Friday at 3 PM, with replays Saturday afternoon, Tuesday at 7 AM, Wednesday at 8 PM and Thursday at Noon, exclusively on The AIR. From 7 PM to Midnight, you can hear five episodes of Harrah’s Hard & Heavy, hosted by Lee Harrah. Lee provides a non-stop onslaught of Metal and Hard Rock, with a lot of surprises tossed in along the way, all presented in Lee’s imitable style and grace. Harrah’s Hard & Heavy can be heard Friday at 8 PM and Saturday at 11 PM, and if all goes according to plan, we’ll be featuring new episodes this fall. 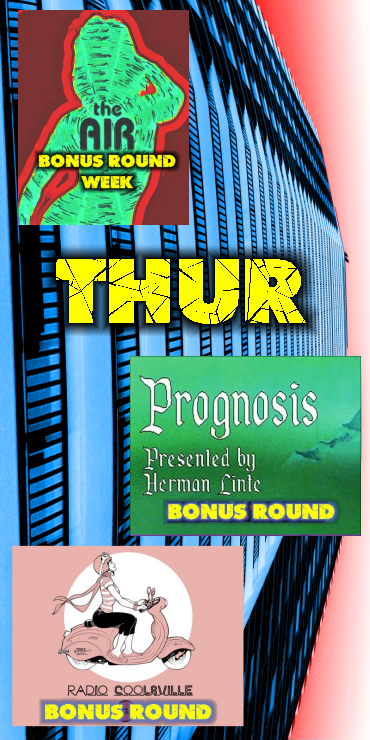 Thursday sees Prognosis, our showcase for Progressive Rock, take the daytime spot, from 7 AM to 7 PM. Originally hosted by Haversham Recording Institute Chairman, Herman Linte, for much of this year yours truly has been filling in behind the microphone. Herman plans to return to the show this fall, and this mini-marathon offers shows hosted by both of us. Prognosis brings you the cool stuff, the intricate, complex rock music that arose in the late 1960s, and continues today with a healthy dose of bombast, virtuosity and an intelligence that is often mistaken for pretension. You will hear classic Prog-rock artists like ELP, YES, Pink Floyd, Genesis and King Crimson mixed in with today’s rising stars like Tomorrow’s Eve, Sonar with David Tom, The Frankly Valentyn Project and The Blank Page . Prognosis can be heard every Thursday at 3 PM, with replays Friday at 7 AM, Saturday at 8 AM, Tuesday at 8 PM and Wednesday at 10 PM, exclusively on The AIR. From 7 PM to Midnight, you can hear five episodes of Radio Coolsville, which came to us from WMUL Radio in Huntington. DJ Betty Rock brought us a weekly hour of the best of Alternative Rock and whatever else happened to catch her fancy. Radio Coolsville is out of production now, but we still have around ten episodes that haven’t been heard on The AIR yet, and we will be releasing those later this fall. You can hear the best of Radio Coolsville every Tuesday at 5 PM. Wednesday sees Curtain Call, our showcase for the best of musical theatre, take the daytime spot, from 7 AM to 7 PM. Curtain Call is hosted by Mel Larch (AKA Mrs. PopCulteer) and presents a wide range of the best show tunes in recorded history. From classics numbers from shows like 42nd Street, West Side Story and Hello Dolly to modern classics from Book of Mormon, Hamilton and SpongeBob Squarepants, Mel keeps her listeners entertained with a thoughtful mix of the best the stage has to offer. Curtain Call can be heard Wednesday at 3 PM, with replays Thursday at 7 AM and 8 PM and Saturday at 6 PM. An all-night marathon of Curtain Call episodes can be heard Wednesday nights, beginning at Midnight. From 7 PM to Midnight, you can hear five episodes of Beatles Blast, presenting music by, about, and inspired by The Beatles. Hosted by yours truly, this hourly intraveneous dose of the Fab Four brings you the classic songs, solo material, rare collaborations, covers by other artists and on occasion, interviews and documentary presentations about The Beatles. Beatles Blast can be heard Wednesday at 2 PM, Thursday at 11 AM and 9 PM, Friday at 5 PM, and Tuesday at 9 AM. Tuesday sees Radio Free Charleston, our showcase for local music from West Virginia, take the daytime spot, from 7 AM to 7 PM. Radio Free Charleston is the long-running program hosted by yours truly, Rudy Panucci, that presents music from Charleston and other cities in the state that may just surprise you in terms of style, variety and the sheer depth of musical talent on display. This show began in 1989 on broadcast radio, and after a few years in limbo, RFC returned in 2006 as a video program, before making the transition back to radio, via the internet, in 2014. Now, with the video show on hiatus, and a new role as the flagship show of The AIR, Radio Free Charleston continues its mission to show the world that there’s more to West Virginia music than Country and Bluegrass and “Country Roads.” You’ll hear punk, metal, progressive, jazz, standards, experimental and many other kinds of music. 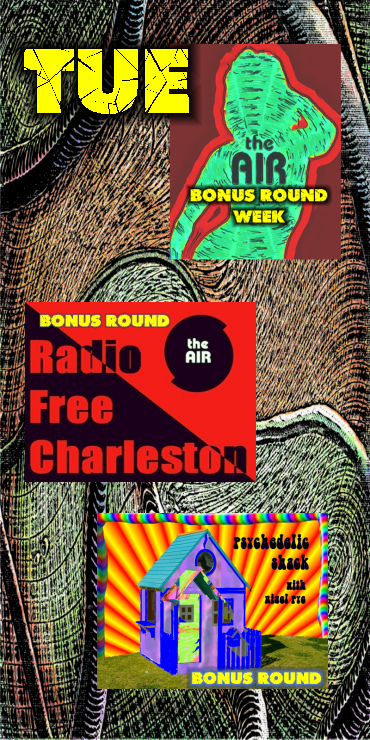 Radio Free Charleston can be heard Tuesday at 10 AM and 10 PM, with replays Thursday at 2 PM, Friday at 8 PM and Saturday at 11 AM and Midnight, exclusively on The AIR. From 7 PM to Midnight, you can hear five episodes of Psychedelic Shack, produced by our friends at Haversham Recording Institute in London, England, and presented by Nigel Pye. Each week Nigel creates a mind-expanding mixtape with this showcase for Psychedelic Rock, Every Tuesday you can tune in, and turn on with an all-new hour of mind-altering and mood-expanding music from his home base at Haversham Recording Institute. Psychedelic Shack can be heard Tuesday’s at 2 PM, with replays Wednesday at 11 AM, Thursday at 5 PM and Saturday at 7 AM. Wrapping up September’s art, which was all inspired by your PopCulteer’s early-in-the-month surgical strike visit to New York City, we have a digital painting of the glorious sight that befell my eyes once I wandered out of the 161st Street Station, The House that Ruth Built (sort of), Yankee Stadium. 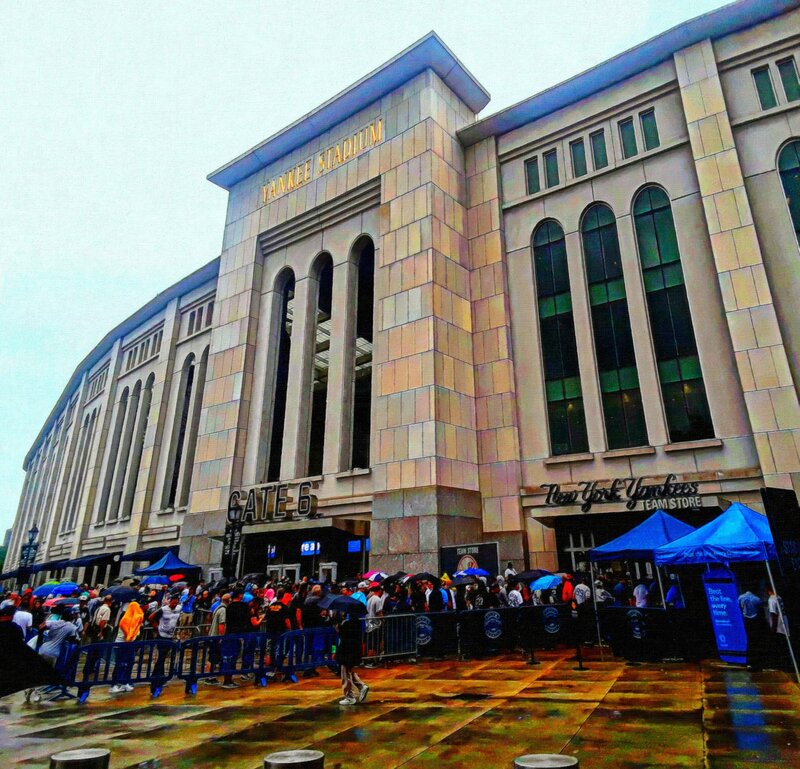 I wrote about my visit to this holy ground HERE. For this painting, I used some photographic reference, but the photos didn’t make it seem big enough, so I improvised a bit. I went hyper-realistic again with this one, after starting the month with two works of abstract Impressionism. I try not to overthink these artistic decisions, and just go with what I think works best for the subject. You can see this in a bigger version by clicking on it. 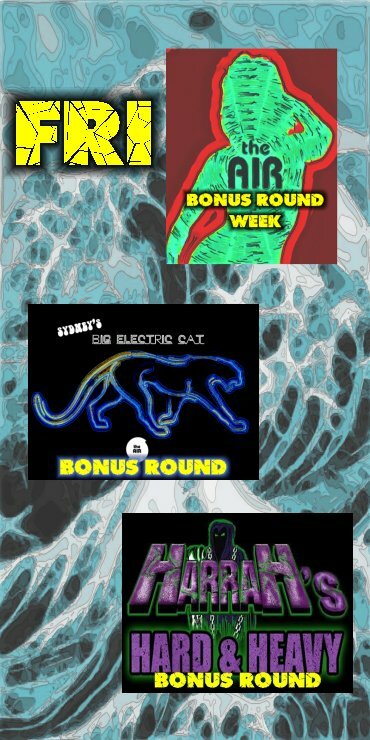 Meanwhile, today on The AIR, you can catch the first day of BONUS ROUND WEEK, where we bring you different marathons, spotlighting our musical programming, which normally occupies the afternoon timeslots. Check back each day this week for notes on what you can hear that day. Fred “Tex” Avery was one of the greatest gag cartoon animators in history. He either created, co-created, or developed Bugs Bunny, Daffy Duck, Porky Pig, Elmer Fudd, Droopy, Screwy Squirrel, and Chilly Willy. 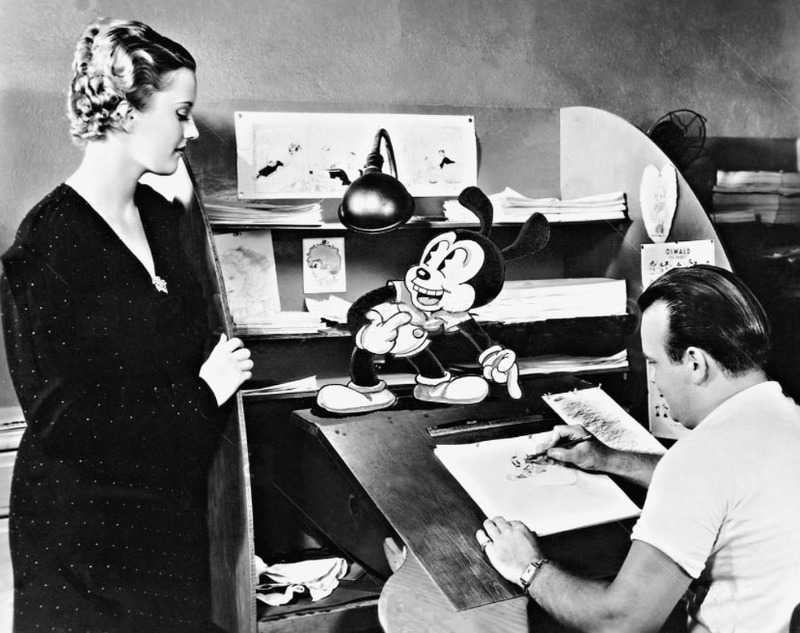 Whether it was his early work at Warner Brothers, his creative peak at MGM, or his later years with Walter Lantz and advertising work, Avery’s sense of humor helped shape several generations of cartoon fans into the twisted mass of insanity that we are today. His cartoons may well be the funniest ever made, and his influence continues to be seen in animation today. Check out these two documentaries and one collection of cartoons to find out why. Be warned that the first one ends abruptly, but it’s still filled with great interviews and clips from his work.